Daughter of Henry VIII. by Anne Boleyn. Born 1533. Prisoner in the Tower for a time (1554). Succeeded to the throne on the death of her half-sister Mary. Crowned at Westminster, January 15th, 1559. A great as well as fortunate sovereign-a courageous woman of keen intellect, who, if she had wise counsellors, as indeed she had, showed that she was well able to choose them. By general assent "Supreme Head" of the Protestant world of her time. Though she was endowed with all the goods of nature and fortune, and adorned with all those things which are valuable and to be desired, there were some things in her that were capable of amendment; nor was there any mortal whose virtues were not eclipsed by the neighbourhood of some vices or imperfections" (Bohun, in "Nichols's Progresses"). One of the greatest of queens, and one of the most flattered and vain of women. Her "beauty" and her "divine perfections" were a theme of admiration by some of her court till her age was past three-score years. Sir Walter Raleigh (among others) "could not exist out of her presence," at a time when she was more renowned as queen than beautiful as woman. But "God had given her a heart that did never fear any enemies"; and that the stoutest that ever beat in queen. The most memorable event of Elizabeth's reign was the victory won by the sea-captains of her fleet-great men all by the record-over Spain's Invincible Armada. England itself was glad enough to be vain of that victory (commemorated on Plymouth Hoe) which crippled the power of Spain. An event of Elizabeth's reign, hardly less important, for years threatening the peace of her kingdom, was the avowed pretensions to the English crown of Mary, "commonly called Queen of Scots"; who was supported by much sympathy among Englishmen themselves, as well as by the tie of marriage, and the bond of a common religion with the two most powerful sovereigns of Europe - those of France and Spain. 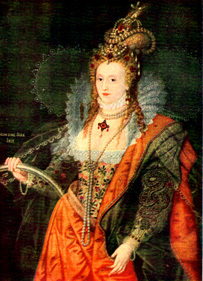 Mary's execution in Fotheringhay Castle took place the year before that victory over the Armada, whose challenge to England was in a measure induced by that extreme penalty exacted and finally consented to by Queen Elizabeth. Elizabeth's aims were "to preserve her throne, to keep England out of war, and to restore civil and religious order." In pursuing those aims she was supported by as able a group of statesmen, of whom Cecil and Walsingham were foremost, that ever Queen had. Nor was she less fortunate in finding able commanders by sea and land to promote the welfare of her kingdom. The greatness of Queen Elizabeth rested, above all things else, on her power over her People. "Nothing, no worldly thing under the sun, is so dear to me as the love and good will of my subjects."